Since 2015, we are also able to offer a service in felling and processing trees. In an industry that is so unforgiving of errors, the health, wellbeing & safety of all our staff lie at the forefront of our business and our strong commitment to safe working practices is a constantly evolving process of research, development and hands-on experience. We like trees. Healthy trees have a big influence on a successful environment and we pride ourselves in maintaining healthy trees, that will stand the test of the Great British weather over many years. Trees support the environment we live in and are ascetically appealing almost anywhere, yet even more so in and around the grounds of property and clearly add value and allure should the property be placed on the housing market. We will always ask you if you are certain that a tree needs to be felled, as without stating the obvious, once our work is done, it can’t be undone. That said, we do acknowledge that decaying trees or branches can potentially pose a safety risk, more so during inclement weather and high wind and care should be taken if you feel that a tree on your land, or along a public highway for example, has the potential to fall unaided. That is the reason why we are advocates of only felling trees when there is an underlying reason for doing so. Moreover, we do recognise that trees, especially within a garden can on occasions begin to impact negatively on its surroundings if they are left to their own devices. After a tree’s canopy is left to grow, there is often a considerable decrease in light. It can also be that a tree is too close to a building or that a limb from a tree grows out over a building and becomes a concern or a danger. Trees that have been planted many years previously often reach a stage of over-crowding one another and some need to be selectively removed. It is also often the case that a particular tree has grown so large, that it encroaches on to neighbouring properties / over a public footpath etc, which may be the precursor to neighbourhood disputes starting. Whatever your requirements or your preferences, we can help. Just like the Japanese Knotweed side of our business, we provide free site assessments and providing we will not contravene any legislation, we will carry out any work we are instructed to. 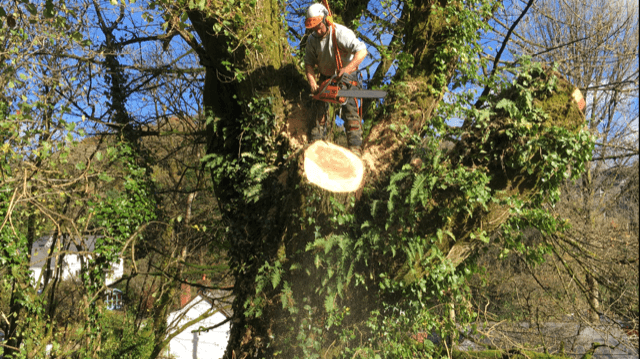 South Wales Knotweed Removal & Tree Services Ltd offer a wide range of professional tree felling services. These include reducing, thinning, re-shaping, sectional dismantling, site clearance, hedge trimming and management. We are happy to cut any wood to the size you require in order to be used or sold for firewood. Alternatively, we are happy to use our chipper to reduce the ‘left overs’ or to take the wood off-site. This line of work overlaps with our garden/site clearance and works well with our weed control service. Since starting this area of our business, we have observed a consistent increase in demand for general trimming and maintenance such as branch cutting and hedge strimming, whilst we also carry out private work for householders and on larger scale construction contracts for property developers.